Last night, the list of the Madoff scandal victims were released. For many, the actual dollars lost were included in the report. 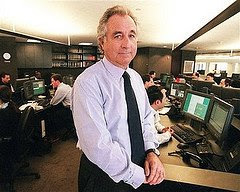 The Wall Street Journal has a copy of the 162 page madoff client list in PDF format. You can download it and see if any of your rich friends are on this list. Well, I guess they might not be rich anymore. There is a Barry Schwartz on the list, but it is a Barry A. Schwartz in Merrick, New York - which I think is in Long Island. Anyway, it is not me. WSJ also has a clean list of the most exposed victims of Madoff. Too many names on that list look familiar, including many charities, non-profits and schools. I keep thinking, "what a shame... what a shame..."